As a scientist, I am often asked to explain aspects of how science works, and why things do not work in what feels like an intuitive way from the questioner’s perspective. A good example is a question from devout Christians about why if we call evolution a theory, we cannot also call creationism a theory. The answer is a straightforward one, but I enjoy it because it can make for a debate that goes somewhere, and is generally not one that either party comes out of feeling too bruised. What is often difficult to explain are the subtler points of the development of theories. It is easy to give a broad-brush answer along the lines of lots of people contributing over a number of years, typically from different fields that shape a theory and continue to make it testable. However, the confusion on the faces of non-scientists makes this answer a bit useless. Something that one cannot indulge in during a social discussion is the solid use of case studies (I have yet to meet someone who can manage the tonal shift of turning a drinks reception into an impromptu PowerPoint presentation about the development of science). One such case study about how science has developed in practice, is our understanding of a group of lipids based on a molecule called sphingosine (Figure). The chronology of this development starts in the nineteenth century with its discovery, by Johann Ludwig Wilhelm Thudichum, a pioneer of brain, and thus lipid chemistry. It is generally believed that he named it after the ancient Egyptian Sphynx because he observed that it had an enigmatic chemistry*. What is clearer is that sphingosine is the central building block of the class of lipids known as sphingolipids. The secondary amine (nitrogen atom, N, Figure) is acylated in vivo (in living organisms) to give a sub-class of lipid called ceramides. These were named after the tissue in which they were discovered, the cerebellum, and are roughly analogous to the glyceride portion of glyceryl lipids. Figure. 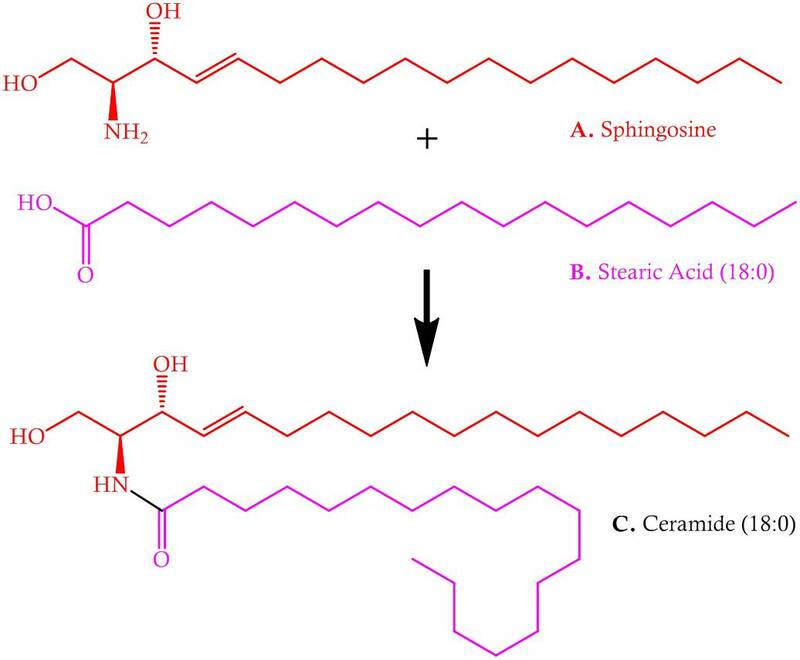 The acylation of sphingosine (A) with fatty acid (B) to give ceramide (C). The black bond in C represents the newly-formed amide bond. Further work after their discovery increased our understanding of the lipid portion of eyes, in particular , establishing what sort of lipids comprised the lipid fraction (1857), and noting how this fraction differed in some diseases (1914). How the lipid fraction shifted with age took longer, with landmark discourses only well into the twentieth century (1935 and 1965). These discoveries were made decades apart. The length of time the story of sphingolipids unfolds over is therefore perhaps partly a result of their enigmatic nature. At the time of the discovery of sphingosine, the techniques for establishing molecular structure were time-consuming, painstaking and not always conclusive. Such studies were also only possible after considerable effort had been put into purifying the analyte. It was not until the late twentieth century that biochemical techniques had developed sufficiently, and enough work had been completed, to produce a clear picture of what sphingolipids do  and where they are located [2-4]. Lipidomics techniques using mass spectrometry, developed only in the last decade, have shed light on the range of sphingolipids in vivo [5,6]. Spectral techniques for determining molecular structure have contributed to the demonstration of novel sphingolipids, such as 4,5-dihydrosphingomyelin  – the largest component of the lipid fraction of the human lens. The fatty acid component of sphingolipids alone is worthy of study, with recent work showing some of the complexity of this fraction . The progress in the chemistry and biochemistry of sphingolipids coincided with an increased research effort into the physical behaviour of lipids in vivo, with recent work providing conclusive evidence about their physical properties . This exciting increase in the understanding of sphingolipids, from a variety of research fields, remains strong. Some very recent research provides evidence that sphingolipids have a role in the physical process of division in at least one type of mammalian cell . This physical role of this class of lipids is an unexpected contrast to the biological role sphingolipids have as molecular messengers in processes such as angiogenesis, neurodegeneration and diabetes. However it may not be unique; it appears that inositide lipids have both structural and biological roles. Even this short explanation of the history and recent developments of sphingolipids defies understanding at first glance. It is an example of how scientific discovery follows a non-linear trajectory, suffering and benefitting from events that are unconnected with its intellectual and practical value. Such a genesis is much better described by an historical account. A straightforward and simple account of ancient ceramics, many of which date from the same time as the enigmatic Sphynx, as well as later civilisations like the Mycenaeans are good examples. Unlike the ancients, however, the story of the sphingolipids is not yet over. We have yet to marry the dual biological and physical roles entirely, and we have yet to pinpoint the roles of the individual members of this class. Only when we do, will this enigma fall into the pages of history. L. Huang, V. Grami, Y. Marrero, D. Tang, M. C. Yappert, V. Rasi, D. Borchman, Invest. Ophthalmol. Vis. Sci., 2005, 35, 4333. Y. A. Hannun, L. M. Obeid, J. Biol. Chem., 2011, 286, 27855. S. Furse, unpublishd data, 2012. M. N. Islam, M. P. Jacquemot, S. Coursol, C. K. Y. Ng, New Phytologist, 2012, 193, 51. Rebecca L. Shaner, J. C. Allegood, H. Park, E. Wang, S. Kelly, C. A. Haynes, M. C. Sullards, A. H. Merrill, J. Lipid Res., 2009, 50, 1692. W. C. Byrdwell, D. Borchman, R. A. Porter, K. G. Taylor, M. C. Yappert. Invest. Ophthalmol. Vis. Sci., 1994, 35, 4333. K. P. Shaw, N. J. Brooks, J. A. Clarke, O. Ces, J. M. Seddon, Robert V. Law, Soft Matter, 2012, 8, 1070. N. Jimenez-Rojo, A. B. Garcia-Arribas, J. Sot, A. Alonso, F. M. Goni, Lipid Bilayers containing sphingomyelins and ceramides of varying N-acyl lengths: a glimpse into sphingolipid complexity, Biophysical Society Conference, 2014. *However it is unclear why this particular enigma was chosen, and not one of the many others he must have been aware of (e.g. La Giaconda), some of which seem at least superficially more appropriate to a researcher of brain chemistry (e.g. Michelangelo’s ‘hidden’ anatomy lesson in the Sistine Chapel).